Corresponding objects are those that appear in the same place in two similar situations. It often happens with angles as shown below. Angle A on the left is the corresponding angle to K on the right, because they are in the same location in the two similar shapes. We say A corresponds to K.
This terminology appears frequently in connection with congruent and similar shapes. When a line cuts across two parallel lines it creates pairs of corresponding angles as shown below. 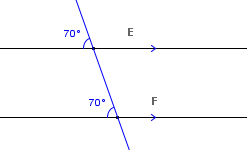 The two 70° angles are called corresponding angles. See Corresponding angles for more.